Jake Haddad has been involved in the motorcycle industry, shooting motorcycle action scenes for over five years and is offering you the opportunity to have your own personal, action photographic shoot to capture that one in a million, perfect shot! If you are a Dirt Bike rider or a Road Rider and you have always dreamed of being photographed like a pro, we can capture the image you want. 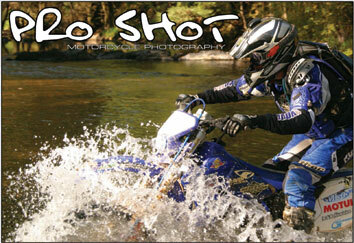 From jumps/berms/water crossings to fantastic sections of road with scenic backdrops. We shoot on location in order to nail the best shots of you on your machine. Whether you are looking for a poster size print or a few smaller prints, we have packages to suit every need and budget. Click Here to check our services and price list. A Pro Shot photography session is a great idea for a Christmas or birthday present for that special revhead in your life. Click Here to purchase a Gift Voucher. We also offer a graphic modification service, with many different effects to chose from. Click Here to go to the Gallery and check out some of the effects. Lower your costs by organizing a group shoot. Organize your friends to come out on their bikes for a Pro Shot group photo shoot and save money on time and setup costs. Ever wanted to check out your riding style? We also have a digital video bikecam service. 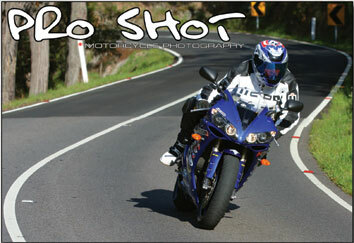 We can follow one or more riders and capture the action on digital video! Imagine a DVD of you and your mates, carving up the road, cut to music of your choice!